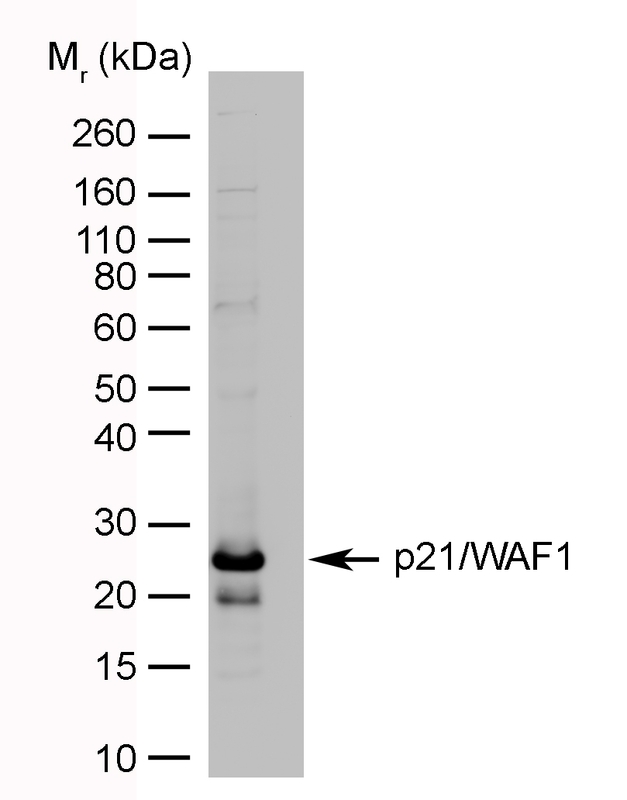 p21/WAF1 transfected cell lysate probed with Mouse anti Human p21/WAF1 antibody, clone WA-1 (MCA2325). Mouse anti Human p21/WAF1 antibody, clone WA-1 recognizes human Cyclin-dependent kinase inhibitor 1, also konwn as CDK-interacting protein 1, cyclin-dependent kinase inhibitor p21/WAF1, p21, WAF1, CIP-1, Melanoma differentiation-associated protein 6 or MDA-6. The CDK inhibitor p21 is an important cell cycle regulatory protein which inhibits cell cycle progression at both the G1 and G2 checkpoints. The expression of p21 is inducible by a wide range of stress stimuli. Mouse anti Human p21/WAF1 antibody, clone WA-1 detects a band of approximately 21 kDa in MCF-7 cell lysates following UV radiation by western blotting. Horký, M. et al. (1997) Induction of cell-cycle inhibitor p21 in rat ventricular myocytes during early postnatal transition from hyperplasia to hypertrophy. Physiol Res. 46 (3): 233-5. Kotala, V. et al. (2001) Potent induction of wild-type p53-dependent transcription in tumour cells by a synthetic inhibitor of cyclin-dependent kinases. Cell Mol Life Sci. 58 (9): 1333-9. Kolár, Z. et al. (2000) Relation of Bcl-2 expression to androgen receptor, p21WAF1/CIP1, and cyclin D1 status in prostate cancer. Mol Pathol. 53 (1): 15-8. Khanna, S.J. et al. (2001) v-Abl protein-tyrosine kinase up-regulates p21WAF-1 in cell cycle arrested and proliferating myeloid cells. J Biol Chem. 276 (14): 11143-50. Scott, M.T. et al. (2002) PDK1-dependent activation of atypical PKC leads to degradation of the p21 tumour modifier protein. EMBO J. 21 (24): 6771-80. Blaydes, J.P. et al. (2001) Stoichiometric phosphorylation of human p53 at Ser315 stimulates p53-dependent transcription. J Biol Chem. 276 (7): 4699-708.